Several weeks ago, the article here on the blog featured the an introduction to the upper management of the J-2X development effort. Now, I am going to introduce you to much of the next tier of our motley – yet talented – management crew, namely the subsystem managers here on the NASA side. 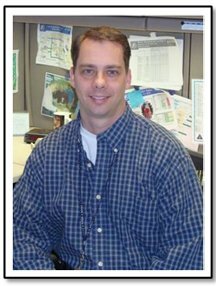 Rick Ballard is the systems engineering and integration manager. He is a product of the great Southwest U.S. and is therefore (it would seem to follow) a connoisseur and master chef of chili in multiple forms and variations, including some formulations can also be either eaten or used to scour barnacles from the hulls of ships. 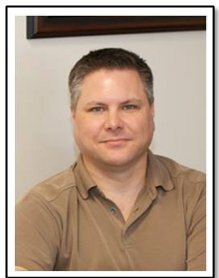 Rick is a graduate of Texas A&M who worked for support contractors, starting in 1987 first for Martin Marietta and then Sverdrup Technologies, before joining NASA over ten years ago. He is widely known for having an encyclopedic knowledge of space propulsion systems and is quite active in professional aerospace industry associations. When not working or spending time with his wife and two daughters, he can either be found participating in fencing or, as he puts it, “chilling” at his farm north of Gurley, AL. 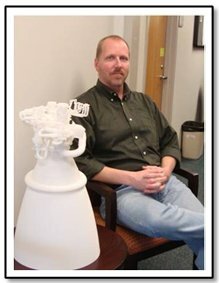 Gary Genge, subsystem manager for Turbomachinery, like our chief engineer Eric Tepool, is also an Auburn University graduate and, like our chief engineer, began work at NASA in the turbomachinery branch. He started working for NASA in 1987. Back then, of course, the turbomachinery branch was immersed in Space Shuttle Main Engine (SSME) support. 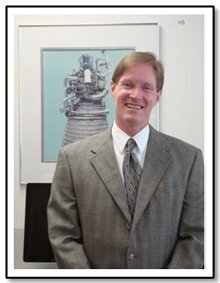 He was also the lead systems engineer for the Advanced Space Transportation Program and the NASA-side project manager for the Integrated Power Demonstrator (IPD) engine, which was a really cool technology demonstration engine using a full-flow staged-combustion cycle engine. Gary has three daughters and so, of course, has become an expert in attending dance recitals and gymnastics meets in his off hours. When not exercising this expertise, he has been known to golf, or play pool, or, once upon a time, far, far away from here, scuba dive. 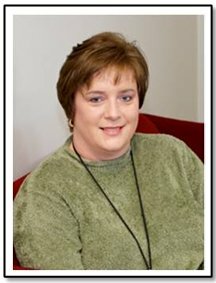 The business office for the Upper Stage Engine Element office is led by Joan Presson, originally from Pulaski, TN. While “business” is not technically a J-2X subsystem, without the flow, control, and accounting of the dollars and cents, nothing else can happen. The interesting thing about Joan is that, strictly speaking, this is her first gig as a “business manager.” It is not, however, her first time dealing with all that business stuff given that over her nearly 24 years with NASA she was manager or deputy manager for a variety of small projects in the space sciences area where business management was part of the role for the project manager. Joan has a bachelor’s degree in English, another bachelor’s degree in Electrical Engineering, a master’s degree in project management, and coursework complete towards a doctorate in systems engineering. It was during her graduate work that she met her husband and today they have a 12-year-old boy. When not helping with his homework, or engaging in other activities with her son, Joan loves to get deep into hands-on house renovation projects. Twenty years ago, Mike Shadoan started here at NASA MSFC straight out of the University of Kentucky graduate school. He’s still here, working hard, as always, but now diligently plugging away as our combustion devices manager. He started as a designer in the area of control systems and mechanisms and that’s where he earned the accolade of co-inventor of the year for MSFC for a selectively-locking knee brace design. For the last ten years, though, he’s worked all facets of combustion devices development. On the COBRA engine project, he was the subsystem manager for the thrust chamber assembly. On IPD, his job was geared more towards the manufacturing processes. On the Fastrac engine project, he was back focusing on design. In other words, he’s perfectly suited for his current job. But when not doing that, you can find him pursuing his hobby as a beekeeper or coaching either fast-pitch softball or basketball for any one of this three daughters. The Upper Stage Engine Element office has set aside a management block dedicated to J-2X production. The person managing this block has the responsibility to establish what is necessary beyond the J-2X development effort in terms of supporting a flight program. 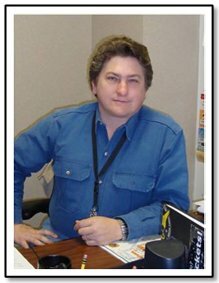 Bill Jacobs, native of Rochester, New York and graduate of the University of Alabama, is the J-2X production manager. He began working here at NASA as a co-op in the mid-1980’s. His technical specialty back in those days was control system electronics. Working out of the engineering laboratory, Bill supported an alphabet soup of different projects and programs, from the Orbital Maneuvering Vehicle program to the National Launch System to the Fastrac engine development project. From there his career transitioned towards systems engineering and for quite some time Bill was stuck with the moniker of “Requirements Guru.” When not at work, Bill brews beer, plays tennis, and works on his photography. Those things are only possible, of course, when not spending time with wife and three daughters. Finally, Bill is one of those rare guys who played in his high school band 30 years ago and can still competently toot his trumpet when the mood strikes him. A man with a diverse background within government employment is our manager for engine controls, valves, and instrumentation, Jeremy Richard. While he’s only been with NASA for about eight years, his total government service with Space and Missile Defense, the Army, and the Army Corps of Engineers comes in at 17 or 18 years (depending on how you add it up). Previously with NASA, Jeremy worked in the SSME office and even there sought a diverse experience spending a year and a half in California at the prime contractor site acting as a safety and mission assurance representative and also a year at the NASA Stennis Space Center in southern Mississippi in the SSME project resident office. He is a graduate of the University of Alabama in Huntsville, has four quite active children, and spends most of his off-hours time with his kids or working on his house and six acres of country land. An interesting additional fact about Jeremy is that he is a licensed preacher so should the need arise for an emergency, in-office wedding, we’re covered. 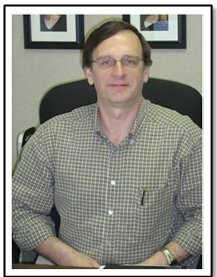 Our subsystem manager for engine systems hardware is Andy Hardin. If you’re wondering about what “gine system hardware” is, it’s basically everything not covered by the other hardware subsystems, which means that it consists of lots and lots of various piece parts. It’s probably appropriate then that Andy is our manager here given his diverse background. Andy spent several years in the Army, living in Louisiana and then three years in Fairbanks, Alaska. After the Army, he went back to school, earned his degree and pursued several jobs in the telecommunications field, working as engineering manager and program manager, including management of the establishment of a cellular network along the Gulf Coast. Andy has been working in support of NASA since 2003. He’s a golfer gifted with a broad spectrum of emotional display on the course, an excellent pool player, the world’s greatest collector of gadgets, and general household tinkerer/putterer. And, on top of that, he has two very young children. Busy man. Like the business office, the Upper Stage Engine Element procurement office is not technically a J-2X subsystem. But considering that NASA as an agency buys products and services from the private sector to the tune of well over 80% of our budget, having competent procurement specialists in place is an absolute necessity. Luckily, we have Kim Adams leading our procurement office. 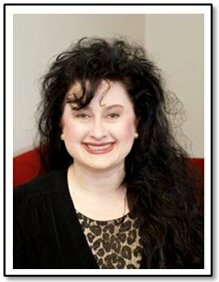 Kim is an Auburn University graduate with a degree in management. She’s been with NASA for a total of 18 years and in her spare time dabbles in real estate. Trust me, if there was anyone that you’d want to take into a tough negotiation, it’s Kim. That’s not just because of her experience and intelligence, but because, as she says, she has a great poker face when needed. I’m sure that that has also been helpful in raising two sons, one of whom is a freshman at Auburn and the other is a tenth-grader and avid soccer player. When given the opportunity, Kim loves to travel, attends many Auburn football games, and is eagerly looking forward to a trip to Key West in May. And while she only keeps up today with some keyboard playing for fun, back in high school she played saxophone, xylophone, and piano. Much earlier in this blog series, I provided a definition for “Datadog.” If, with that definition I’d wanted to include a photograph, I would have included an image of Marc Neely, our subsystem manager for assembly and test. 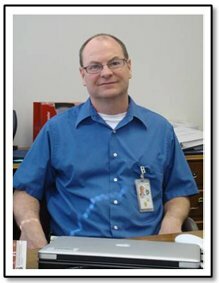 Marc has spent the largest portion of his career, starting with NASA in 1985, supporting the various incarnations of the engine systems branch here at MSFC, the native home of those feral beasts known as Datadogs. In so doing, there are very few engine projects over the last two decades that Marc has not touched. Beyond that, he has interests in woodworking (he was once a carpenter) and art (once a subject of his collegiate studies as a younger man). Marc just recently got back from a trip to Nicaragua where his soon-to-be-doctor son got married to his soon-to-be-doctor and now daughter-in-law from that Central American country. So, that’s just a further sampling of our office. These are my coworkers and friends. Beyond these folks, there are literally hundreds of people behind the J-2X development effort and they span the country. As we progress, I hope to tell you about more of the people involved.